Ankylosing spondylitis is a systemic disease, which means symptoms may not be limited to the joints. People with the condition also may have fever, fatigue and weight loss. Eye inflammation (redness and pain) occurs in some people with spondylitis. In rare cases, lung and heart problems also may develop. Some people also have pain, stiffness and swelling in their hips, knees or ankles. Ankylosing (Ankylosis): It describes fusion of bones. The spine’s bones (vertebrae) fuse together, resulting in a rigid spine like bamboo. Spondylitis: It is a broad term that describes inflammation (swelling and redness) in the joints of spine. 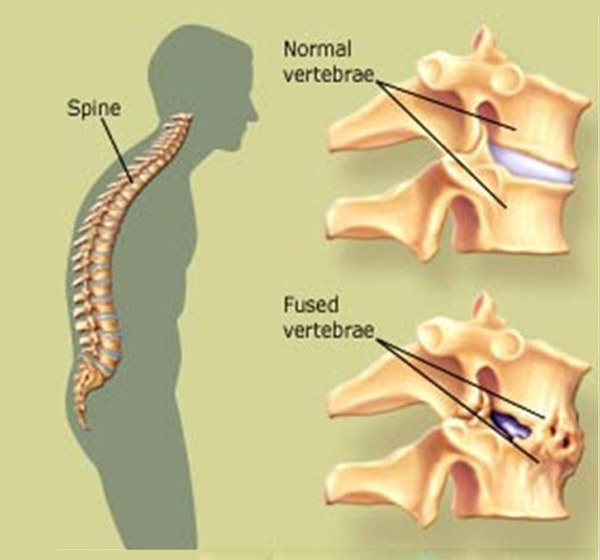 Please note spondylosis is completely different term which means wear and tear in spine. AS is a type of arthritis that mainly affects the spine. Other joints and other parts of the body are sometimes affected. AS is a disease of young adults. Back pain The main symptom is pain in the lower back. You may have pain over your buttocks and back of your thighs. Rest does not make it better. Instead, exercise and movement usually ease the pain. The pain tends to be worse first thing in the morning. 1.Starts before the age of 40 years 2.Comes on slowly over time 3. Worse in the mornings and evening 4. Stiffness in the mornings or after period of inactivity 5. Improves with exercise and worse with rest 6. Can often cause pain in the buttocks. Ankylosing spondylitis affects about 1 in 1000 of the adult population. AS most commonly begins between 15 and 25 years of age, but sometimes it occurs in children and older adults. It is three times more common in men than in women. There may be a family history with two or more members of a family being affected. Commonly begins between 15 and 25 years of age, but sometimes it occurs in children and older adults. It is three times more common in men than in women. There may be a family history with two or more members of a family being affected. What treatments are there for ankylosing spondylitis (AS)? With recent advances in management of AS there are a variety of treatments options available. It is managed through a combination of pain relief, exercises and disease modifying drugs. Modern treatment aims at stopping the disease progression, easing your pain and stiffness, keeping the spine mobile and thus helping you to live a normal life. A rheumatologist is an expert in this disease and should be consulted early in the course of the illness. Newer therapies (Biologics) used by the rheumatologist can slow and in many cases stop the disease progression. Simple painkillers will not prevent joint damage. It is a misconception that allopathy doctors only prescribe steroids and painkillers. Rheumatologists prescribe disease-modifying medications to help with symptoms and stop progression of disease. There have been significant advances in treating AS, especially for patients whose disease does not respond to traditional disease-modifying anti-rheumatic drugs (DMARDs) like sulfasalzine. The most important advance has been the development of a group of drugs called biologics. This group of medications are called biologics because they are derived from living organisms or produced by biotechnology methods. They differ significantly from traditional drugs used to treat RA. Biological drugs target specific components of the immune system instead of broadly affecting many areas of the immune system. Some biological therapies are called anti-TNF drugs. They target a protein called Tumour Necrosis Factor (TNF), which increases inflammation when excess amounts are present in the body. Other biological therapies target different proteins. The newer, second-generation biologics have come to market only in the past 10 to 15 years or so. Other names for biologic therapies include: biologic agents, biologics, biological response modifiers or immunotherapy. Biologics have been shown to help slow progression of AS when all other treatments have failed. Biologics do not reverse existing damage, but can protect the joints against continued damage. Biologics have revolutionized the treatment of various other diseases such as rheumatoid arthritis, psoriasis, psoriatic arthritis, SLE (lupus) etc. Will changing my lifestyle help? The two most important changes you can make is to start exercising and to stop smoking. Taking a professional advice for types of excises is important. There is little proof that changing your diet will help. Physical therapies for ankylosing spondylitis Physiotherapy is a very important part of the treatment for ankylosing spondylitis. A physiotherapist can put together a programme of exercises that increase your muscle strength and help you maintain mobility in your spine and other joints. It’s especially important to exercise your back and neck to avoid them stiffening in a bent position. A physiotherapist will advise you on how to maintain good posture and may also be able to offer you hydrotherapy, which involves special exercises in a warm-water pool. Swimming has proven beneficial effect on quality of life.